Character, stone built, detached house in La Manche with 4 bedrooms, large mature garden with many trees and shrubs, leading down to approx. 100m of river frontage on the river Sienne. Close to beach. 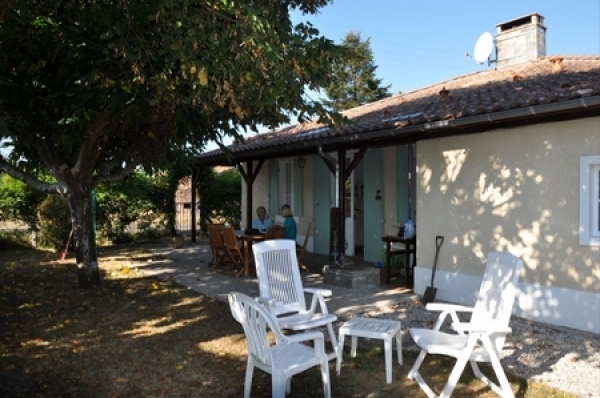 Newly refurbished for 2010, La Senelle is a 2 bedroom gite sleeping up to 4 people. built in traditional local normandy stone. The thick walls ensure the house is cool in summer and warm in winter. Self catering Normandy Rental gites in Saint-James, France. La Grange and Belle Vue cottage. 2 cottage's sleeping up to 20 people available to rent separately or together. Private gardens and Pool. Close to the market town of Brecey, reached by a quiet country lane, this charming Manche holiday cottage nestles in its own orchard and has spectacular views of open countryside. 1 Bedroom, Sleeps 2. Normandy Cottage rental in Beauficel, Manche, France. Charming 3 bedroom cottage with private swimming pool plus a self contained apartment, sleeps up to 9 guests, close to amenities. The cottage is located in a very calm area, surrounded by agricultural fields and dunes, and only 400 m from the beach. It was completely restored in 2014. The Gite at Arts in the Garden is the ideal location for your relaxing rural getaway. It is set in the quiet Normandy countryside, this gite offers a Zen ambiance. FROM £350 PER NIGHT. SLEEPS 11. Spacious, very well equipped 2 bedroom cottage with modern bathrooms and kitchen all newly refitted in 2009, with dishwasher, gas hob/oven, microwave & fridge/freezer. A delightful 150 year old farmhouse which has recently been converted into two well equipped and comfortable Manch holiday gites. Great for a family visit to Mt St Michel. 15 mins from beach. Le Pelican Gite in Reffuveille, Near Avranches, Manche, Normandy, France. Situated in a private and peaceful location. Le Mont St Michel and the beautiful beaches just 30-45 minutes. Secluded Manche Holiday Cottage Rental with Private Pool in Normandy, France ~ Sleeps 11 people in 5 bedrooms, 3 bathrooms. Cottage to rent set in lovely surroundings with the river Lair running through the grounds. Millers cottage is the perfect environment for relaxing outdoors and enjoying peace and tranquillity. Wi-Fi. Holiday cottage in Manche, Normandy, France. Heated Swimming Pool - Sleeps 2/6 + Baby. Les Glycines is situated between Villedieu and the coastal resort of Granville. Les Bas Brulays is a charming farmhouse located in a rural setting in a small hamlet in the heart of rural Normandy. 3 Km from the market town of Sourdeval, Manche, Normandy. Sleeps 6 people. La Sauvagerie is a luxury home comprising an open plan spacious and modern kitchen with dining and lounge areas looking out onto the terrace. Private heated pool. 4* Town House in Sainte-Marie-du-Mont, named The Band Of Brothers House after the 101st Airborne. 2 miles from Utah Beach in the world famous church square. 3 bedrooms 2 bathrooms, garden, wifi & Aga. Our gite La Mare is in the heart of the nature reserve of le Parc Naturel des Marais du Cotentin, with beautiful views. 5-bedroom property providing comfortbale living for 9 people. Chevrefeuille is a large, spacious Normandy Holiday gite designed to accommodate 6/7 people in comfort. Three bedrooms, two bathrooms, living room with wood-burning stove and kitchen area.